The Short Version: The modern dating scene can be a confusing place to find love. Single women often want a committed relationship, but they don’t know how to attract and keep a quality guy, and they end up frustrated by one-night stands, one-word texts, and one more disappointment. Fortunately, the Dating Advice Guru Carlos Cavallo can teach women how to read the signs, gauge their man’s interest levels, and meet his unspoken emotional needs so that he falls head over heels in love. Carlos has 16+ years of experience coaching singles on the nuances of attraction and the fundamental differences between men and women. On his website and Youtube channel, Carlos offers dynamic coaching programs, advice videos, love quizzes, and discussion forums to help clarify what’s going on in a man’s head and what women can do to get him to commit. Sometimes the mind of a man is a total mystery. It’s an enigma wrapped in a cheesy pick-up line. What single woman hasn’t looked at her phone, read a noncommittal text, and thought ‘What in the world is this guy thinking?’ It’s not always easy to understand why a guy texts constantly for days and then disappears or why he agrees to go on dates but avoids physical intimacy. 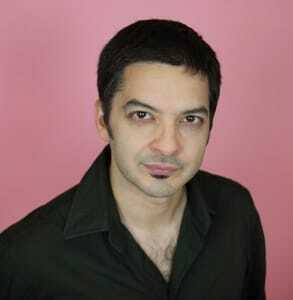 Carlos Cavallo has made a name for himself as the Dating Advice Guru by giving women access to the heart and mind of single men. You could spend an entire girls night trying to riddle out the true intentions behind what a guy says and does. Or you could just ask Carlos Cavallo, aka the Dating Advice Guru. He has made it his mission in life to bridge the gap between the sexes and clarify the dating world for single women seeking Mr. Right. Since 2002, Carlos has offered his services as a go-to informational resource and dating coach for singles wondering what’s going wrong in their relationships. You can download his online coaching programs or watch his YouTube videos to get his honest insights into what makes a relationship a success or failure. Putting dating into simple terms, he explains the psychology behind attraction to empower women to trigger a man’s interest from the get-to and foster a deep emotional connection. A majority of Carlos’ clients are single women over 35. They’ve probably been in a relationship before, but they’ve never been able to make it work. Now they want to get serious about settling down. That’s where Carlos comes in. He aims to give them that missing ingredient to building a lasting romance by explaining what men think and feel when they’re seriously dating someone. Carlos uses his emotional intelligence and relationship insights to inspire women to conquer the dating world and cultivate a lasting relationship. His straightforward coaching programs clarify common misconceptions about dating and teach women the strategies and mindsets that’ll attract the right man. His latest coaching program, “Forever Yours: The Secret Password to His Heart,” offers single women a step-by-step guide on what they need to do to get a man to fall in love and stay in love for the long haul. It’s not about playing mind games — it’s about understanding your partner’s emotional needs and being able to break through his walls and connect on a deep level. It’s about making him see you as his soul mate, not just another hookup. From how to keep the passion alive to what to say when a partner starts pulling away, Carlos’ library of programs provides practical dating tips for women in a variety of dating situations. Carlos is so certain that women will love his programs that he makes a 100% double satisfaction guarantee. If you aren’t completely satisfied with his online coaching programs, you can send him an email, and he’ll refund your money within 60 days. If you’re not sure what’s going on with a guy you’re seeing, you can get a quick answer by taking the love quiz on Carlos’ website. This short quiz gets to the heart of what makes a relationship last and asks daters to consider if their partners are still with them or starting to withdraw. 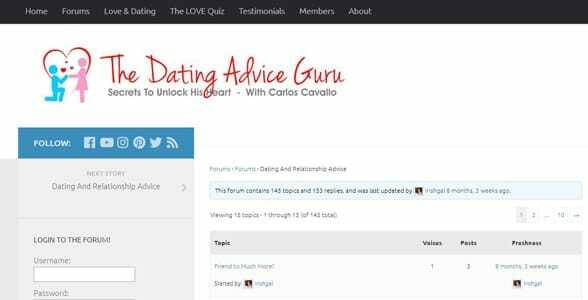 Carlos wants to engage single women in a conversation about dating, so he offers an active discussion forum where members can talk to one another and seek advice or consolation. Anyone can create a profile and start chatting on hundreds of dating-related topics. The Dating Advice Guru forum has hundreds of topics relating to dating and relationships. Women often post on the Dating Advice Guru forums because they have a specific concern (e.g. “Why won’t he call me back?” or “How do I make him see me as more than a friend?”), and they want someone to clarify what’s going on. Sometimes Carlos even jumps into the forums to put in his two cents. Throughout his career as a dating coach, Carlos has received hundreds of glowing testimonials from former clients. Women often praise him for helping them navigate the dating world with more confidence and a greater understanding of the male psyche. A single woman named Janice P. said working with Carlos increased her quality of life. His insights have helped her stay positive even when a guy she’s seeing disappears on her for a few days. Reading the signals and interpreting actions of the man you’re dating can sometimes feel like reading tea leaves or interpreting the stars. You never really know if your understanding of the signs is correct. You could think you’re on your way to a happy ending, and then end up blindsided by a grim breakup. Carlos doesn’t want that to happen, so he equips women with the knowledge they need to understand what’s going on beneath the surface and what they can do to make a man want to commit. The Dating Advice Guru’s easy-to-understand videos and programs offer proven and practical strategies to get results in the dating scene.